Is £40 blender a worthy alternative? The Nutrishot compact personal blender, currently exclusive to Lakeland, offers similar features to the popular Nutribullet blender – but for a more tempting price. We tried it out to see if it could churn out a tasty smoothie without breaking a sweat. Like the Nutribullet 600 (the original and cheapest model in the Nutribullet range), the Nutrishot includes two separate blades for wet and dry ingredients. It also has drinking lids for converting the blending cup into a travel mug so you can store or transport your smoothie. It’s also cheaper, at just under £40. The Nutribullet 600 usually hovers around £60-70, although we did find it on offer for £40 very briefly in John Lewis in early 2017. So if you aren’t keen on waiting around in the hope that the Nutribullet will drop in price again, the Nutrishot could be a good option. Get our initial verdict on this budget blender in the full Nutrishot blender first look review. 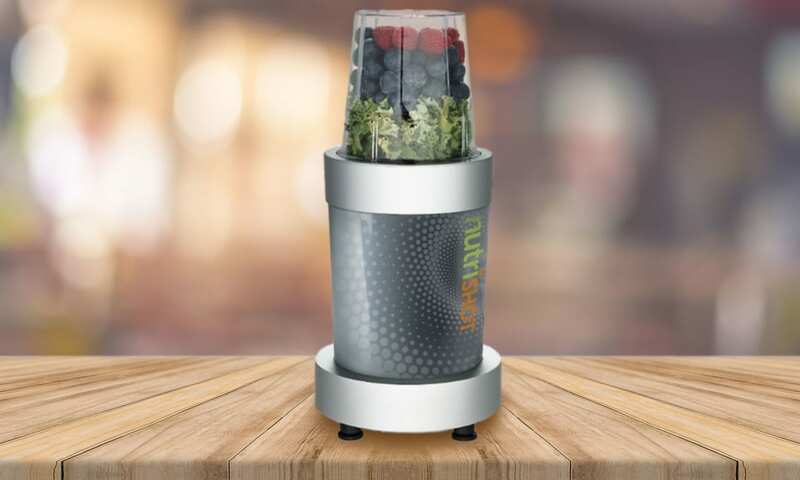 The Nutrishot, like other compact personal blenders, is designed to streamline the process of making smoothies and other blended foods, such as dips and sauces. Unlike a traditional blender, compact personal blenders don’t take up a huge amount of space on your kitchen counter and are designed for making smaller portions in one go. You get two different-sized BPA-free blending cups with travel lids with the Nutrishot, so you can make one or two servings as needed. The included dry blade is for milling seeds and nuts, and the wet blade for blending up smoothies and dips. It’s competitively priced, but it’s also unsuitable for blending hot food and can’t handle crushing ice – unless it’s blended as part of a drink. This makes it less versatile than rival blenders, but if you just want to make smoothies and dips then it might not matter too much. We’ve tested all the major Nutribullet rival brands, including big hitters from Nutri Ninja and Sage and cheaper models from Lakeland, Nutriblend and Salter. We’ve found some that do a brilliant job without breaking the bank, and others that are surprisingly average considering the price. Head to our blender reviews to see which blenders come out on top. We put blenders through a raft of tough tests to find out which ones can blitz ingredients to a smooth and even consistency, leaving you with a tasty, fuss-free drink. We task each blender with a range of smoothie and soup recipes, using hard to blend ingredients like nuts, frozen berries, fibrous ginger and leafy greens to see how they handle tougher fruits and veg. We also challenge each blender to make pesto to see how it copes with drier blends. The best blenders will sail through these tests and also be quiet and easy to use and clean. Find out which blenders we recommend for 2017 in our round-up of the best blenders.